Olga Kikou is a substitute representative of the Citizens’ Committee for the End The Cage Age European Citizens’ Initiative. She is also the head of Compassion in World Farming EU. 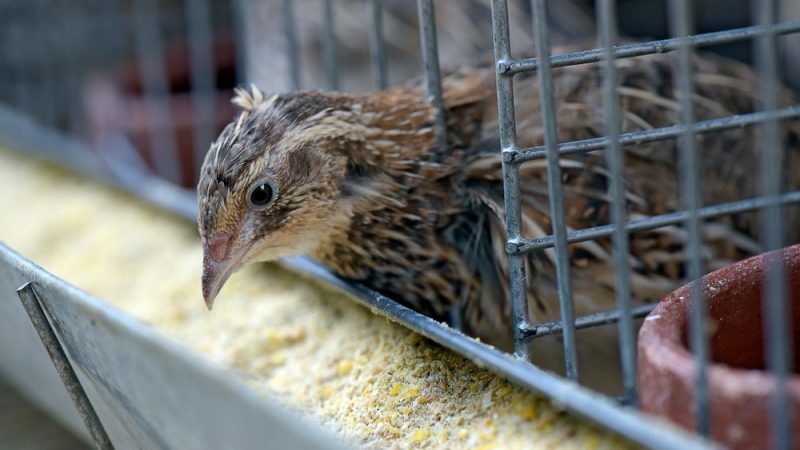 The ECI calls on the European Commission to propose a ban on cages for animals such as hens, pullets, sows, calves, ducks, geese, quail and rabbits. It has already been signed by 330,000 EU citizens (excluding the UK). The signatures will eventually be verified by the individual EU member states before being submitted to the European Commission. The Initiative has received overwhelming support from 150 NGOs and umbrella organisations. Continued changes in public perceptions of farm animals have led to persistent calls for higher protection and laws to guarantee improvements regarding their welfare, including a recent ban on all cages for hens in California. Commitments from retailers and the food industry, responding to consumer demand by removing cages from their supply chains, are proof that a significant part of the industry is responsive and adjusts after consumer pressure. On the other hand, the EU institutions have been very slow to respond, existing cage bans only cover a few species and laws are not up to par with public expectations to phase out caged farming. The lack of progress has prompted many campaigns on this very issue, to end the use of cages. Meanwhile, the agribusiness industry has been on the offensive. In November last year, a lawyer of the European Foie Gras industry sent a letter of formal notice to ciwf.fr, noting that the report ‘End The Cage age: Why the EU must stop caging farm animals’ incorrectly describes the conditions of caged living of ducks and geese used in the production of foie gras, requesting the removal of some of the photos (pp. 22-23). They also posted a statement on their website, inviting readers to visit their farms and see for themselves. In fact, we did go to their farms, together with the NGO Animal Equality, and we did see for ourselves! And, what we saw was the same horrendous conditions as described in the report. Earlier this month, a lobbyist for COPA COGECA, the big agri body of farmers’ organisations and cooperatives, used one of the images from the ECI campaign to undermine its legitimacy, claiming that the picture “was not from Europe but most likely from an East Asian farm” and that it was replaced with a second image as a result of a comment they made. Actually, it is very difficult to tell whether the cages in question are permitted in the EU or not. In fact, this is actual proof that cages are almost indistinguishable. This incident highlights more so that “a cage is a cage”. Battery cages were banned and were replaced by enriched cages, which still confine animals and cause great suffering. Moreover, the lobbyist stated that “[t]he topic brought forward by the NGOs’ network can be debated but this must be based on fair argumentation and facts” – without giving any fair argumentation on why we need to continue the use of cages for farm animals in the 21st century. And, of course, no word about the unimaginable suffering that cages inflict on hundreds of millions of farm animals in Europe, making their lives miserable, cramping them together and denying them the space to move freely. And here are the facts: Over 360 million animals spend all or part of their lives imprisoned in cages in the EU every year. Extreme confinement is a widespread practice in a continent that claims to be a leader in animal welfare! There is an infinite supply of images of the horrible conditions on EU animal farms. Oh yes, these are European farms, not farms in some far away land with a lack of rules. After all, investigation upon investigation reveal the most shameful conditions and unfortunately, these are not the exception. Interestingly enough, Big Agri have nothing to say about the miserable conditions animals are raised in; they have nothing to say about the harsh reality of intensive animal farming in the EU. Instead, they are picking on an image here and there, avoiding the real issue, which is: the suffering endured because of the confinement of sentient beings. It is a shame that Big Agri launches such attacks which threaten to undermine the voice of European citizens. It is a shame that undermining statements are circulating around the corridors in Brussels. The reality of animal farming is often hidden. False impressions about the EU’s animal farming are pervasive. Even the European Commission depicts inaccurate pictures of animal production. Images of bucolic scenery and ample open pasture are quite common in its publications and even on the walls outside the Directorate-General for Agriculture. These are misleading images. Most animals spend their short lives indoors, many of them confined in cage systems. The large majority of EU pigs and chickens are farmed industrially. Citizens need to know the truth. And, the truth is that cages don’t look good. Small or big, barren or enriched, they are still CAGES. The Commission’s reply to our comment regarding the imagery they use was that they try “to highlight with the pictures chosen the best practices in animal welfare, given that the EU has one of the most advanced legislation in terms of animal welfare in the world”. The EU cannot seriously support the claim of high animal welfare standards, as long as cages still exist. Caged farming is one of the most important animal welfare issues of our time. It cuts across many species and involves hundreds of millions of sentient beings. If the EU wants to be a leader in animal welfare as it claims to be, then it’s time to do away with cages and save a place for them in a museum of torture instruments. They should be part of our past, they have no place in our future.